Vegetation is one of the most spatially and temporally dynamic reservoirs of carbon in the world. The amount of carbon stored in vegetation above ground in woody biomass is particularly variable, and is subject to rapid change via land uses that remove vegetation cover, causing carbon emissions. Reducing carbon emissions from deforestation and forest degradation, as well as from other non-forested ecosystems, is therefore a priority in both national and international strategies to conserve ecosystems and to reduce carbon dioxide build-up in the atmosphere. Perú harbors an enormous range of ecological conditions, from hot and humid lowland Amazonian forests to high-altitude Andean ecosystems and desert conditions on the Pacific coast. The diversity of environments in Perú greatly challenges efforts to measure, map and monitor carbon stocks throughout the country. We report the first high-resolution geographic study of aboveground carbon stocks throughout the more than 128 million hectares that comprise the country of Perú. 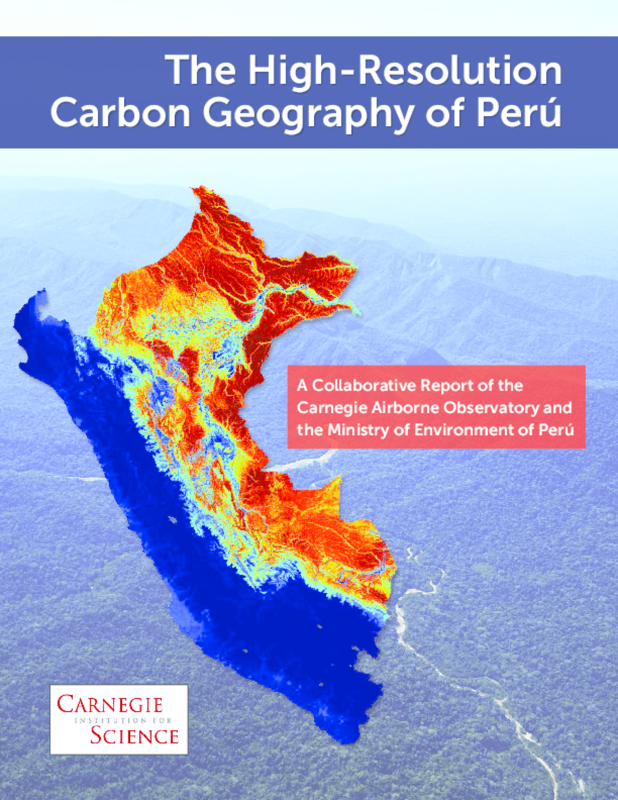 This report communicates the development of our methodology and an extensive validation of the resulting high-resolution carbon map of Perú. It also provides the first quantitative analysis of the basic environmental factors determining the carbon geography of Peruvian ecosystems, political regions, and protected areas. Copyright 2014 Carnegie Institution for Science.